Hiring across the private sector remained strong last month according to recent figures from data collection firm ADP. There were 200,000 new hires in September up from 186,000 the previous month. The sector breakdown showed all major categories increased hiring over the period. The only exception was manufacturing which continues to be weighed-down by the strong dollar and declining production in the commodity related industries. The resilient jobs market helped revive a lacklustre trading session which brings the third quarter to an end. The benchmark US dollar index lifted by 0.4 percent with the greenback making strong gains on the euro, the pound and the yen amongst the majors. The dollar reversed three days of losses as traders were more upbeat that Friday’s full nonfarm employment report will also show a healthy increase in new hires for the month. More disappointment from the US manufacturing sector came in though after the release of this month’s Chicago purchasing managers’ index. The index came in at 48.7 falling from 54.4 a month earlier. This was far below what most economists were predicting and below the 50 mark (which signifies expansion). The euro was hit by some more bad news on the inflation front today. Eurostat’s flash reading on consumer inflation showed prices fell year on year to September taking the Eurozone back into deflation. Unemployment also remained stubbornly high at 11 percent. The deteriorating picture across the Eurozone is leading some traders to speculate that the ECB will need to expand its quantitative easing measures – something that’s bound to depress the value of the euro further. 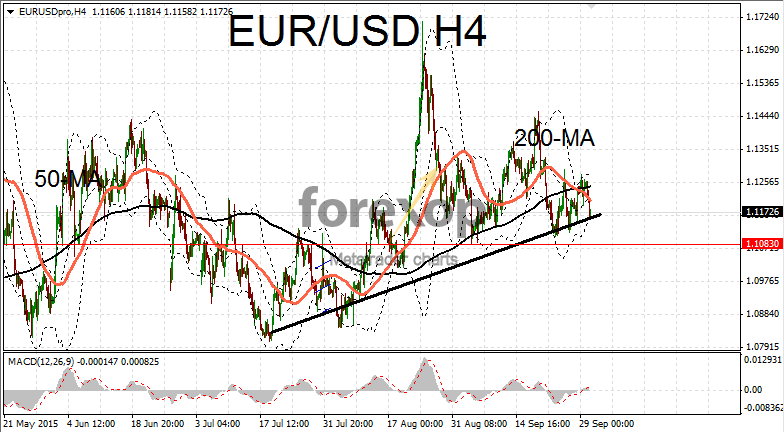 The poor data allowed the greenback to push EUR/USD back below the 1.12 line and further extend the downwards range. 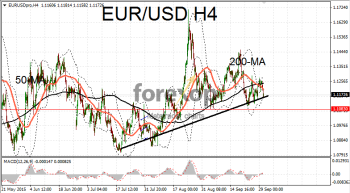 The negative momentum is likely to push the pair lower but we expect the 1.1083 area to provide some support. USD/JPY remains a range bound trade for the time being with fundamentals fairly balanced around these levels. Japanese retail trade figures came in on the soft side last night. Trade was up only 0.8 percent on the year against a forecasted 1.3 percent. The yen however continues to benefit from some risk positioning and this offering support.